The McCauley Business Park in Port Botany has sold out six months prior to practical completion, resulting in $36 million in sales, and almost $4 million in re-sales value. Setting a new benchmark ing sales, the rates represent a record rate in excess of $4,740 per square metre, highlighting the strong demand for quality assets in Sydney’s South. Located at 19 McCauley Street, Port Botany, the 30 unit business park is due for completion next week, with units ranging from 167 square metres to 1,360 square metres. The business park is in close proximity to Port Botany’s container terminal, Sydney’s CBD, Sydney’s airport and major link roads such as Foreshore Drive, Southern Cross Drive, The Eastern Distributor and the M1 and M5 Motorways. According to Colliers Director of Property Sales and Leasing Edward Princi, it is the first industrial estate in several years to offer extra- large industrial units to the market, with three re-sales already occurring before the park has opened. “This mark-up sees the square metre rate at $4,740 – a new record for the area, and signifies the same story we have been hearing about South Sydney all year; there is still a severe lack of supply and high buyer demand. "The race is on to secure good industrial locations which have ease of access to Sydney’s CBD, Port Botany, Sydney Airport and the key link roads,” he said. The larger units feature exclusive on title hardstand that is capable of receiving and unloading large trucks and 40ft containers, not to mention high clearance, clear span 8.5m warehousing, ample car parking, modern, office fit-outs in a secure, gated estate. The medium to large size industrial units have been thoughtfully designed with the end user in mind. Truck access and efficient use of space were the developer’s main goals when designing these functional units. 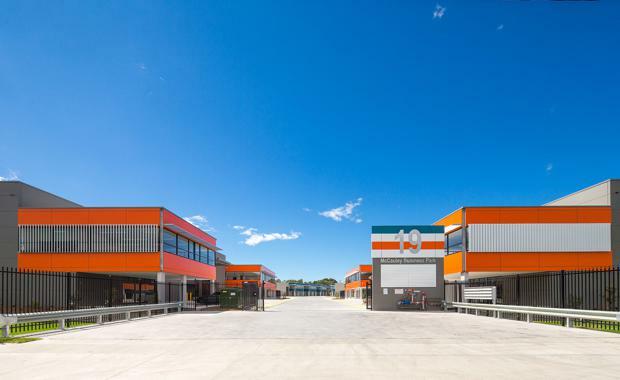 Mr Princi said it is the last single storey and on grade industrial development to be built in South Sydney, with the best truck access and maneuverability available to the market. "Going forward, due to increasing land values we only expect to see multi-level developments,” he said. The estate is also within close proximity to the inner city café culture, bars, eateries, golf courses and expansive parklands of nearby suburbs such as Alexandria, Rosebery, Mascot and Randwick.